2016.7 Attending ICP (International Congress of Psychology) conference at Yokohama. Chang, Y (2015). Science Motivation Across Asian Cultures: Links among Future-Oriented Motivation, Self-Efficacy, Task Values, and Achievement Outcomes. The Asia-Pacific Education Researcher. Chang, Y (2015). Moving towards A New Vision of Education, Elementary Education, 55(1),11-18. Chang, Y., Wang, J., & Lin, W. (2013). Is Gender Gap in Science Performance Closer? Investigating Data from International Science Study. Bulletin of Educational Psychology,44, 459-476. Chang, Y. (2012). Learning progression-integrated framework of formal and summative assessment. Educators and Professional Development, 29, 15-25. Hung, L., Wang, C., Chen, H., Chang, Y. (2012). Construct study of the assessment of sight-word reading and fluency. Psychological Testing, 59, 247-276. Chang, Y. (2011). Assessment for student learning-past, present and future. Elementary Education, 51(3), 36-44. Chang, Y. (2010). Developing information literacy portfolio assessment for primary students. Bulletin of Educational Psychology, 41(3), 521-550. Wu, Y., Chen, Y., Chang, Y., Chen, S., He, T., Lin, J. (2009). Normal mixture model as convergent validity evidence to bookmark standard setting of English reading and listening ability. Bulletin of Educational Psychology.41,69-90. Hung, L., Chen, S., Wang, C., Fang, C., Chang, Y., Chen, M., Ko, H. (2009). A study of the identification process for students with reading disabilities: Screening versus teacher referral. Bulletin of Special Education, 34(1),1-22. Chang, Y. (2008). The reliability of information literacy portfolio assessment in the primary grades. Bulletin of Educational Psychology, 39,43-60. Chang, Y. (2008). Big-fish-little-pond effect on academic self-concept: A development perspective. Bulletin of Educational Psychology, 40(1),23-38. Hung, L., Wang, C., Chang, Y., Chen, H. (2008). Development of assessment of Chinese character lists for graders. Psychological Testing, 55, 489-508. Wang, C., Hung, L., Chang, Y., Chen, H. (2008). Number of characters school students know from grade 1 to G9. Bulletin of Educational Psychology, 39(4),555-568. Chang, Y. (2016). The Hybrid simulation study for the development of an adaptive vocabulary test. Paper presented at the 31st International Congress of Psychology (ICP2016) .Yokohama, Japan, July 24 -29, 2016. Chang, Y. (2016). Developing a Learning Power Scale. Paper presented at the 23rd Congress of the International Association for Cross-Cultural Psychology. Nagoya, Japan, July30-Aug 3, 2016. Chang, Y. (2015).The Internal/External Frame of Reference Model of Self-Concept in Reading, Math, and Science. Paper presented at the 14th European Congress of Psychology. Milan, Italy, 7-10 July, 2015. Chang, Y. (2013, Jul). Reliability of Oral Reading Fluency Measure: Evaluation of Procedures for Passage Selection. The 13th European Congress of Psychology, Stockholm, Sweden. Li, J. & Chang, Y. (2013). The effects of self-regulated learning on reading fluency and reading comprehension for second graders. 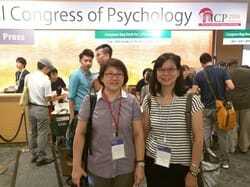 Taiwanese Psychology Association 52th Annual Conference. Taipei. 2013/10/19-10/20. Chang, Y. Tsai, S. & Chang, L. (2013). Developing an online computerized adaptive test of reading comprehension for grades 3 to 6. 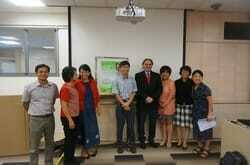 Yonglin Organization Conference on Remedial Teaching. Taipei, 2013/6/28. Chang, Y. (2012, Apr). Parent influence on adolescents’ self-concept, self-efficacy, task values and achievement outcomes in science. 2012 AERA Annual Meeting. Chang, Y. (2011). Links among choice of college math and science major, ability, interest, and self-concept. 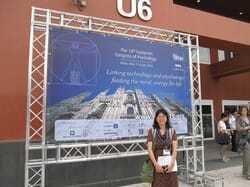 The 7th Chinese Psychologist Conference. Taipei. Taiwan. 2011/9/1-9/3. Chang, Y. & Wang, J. (2010, Jul). Examining testlet effects on the PIRLS 2006 assessment. . The 4rd IEA International Research Conference. , Sweden:Gothenburg. 2014-2016 The Hybrid simulation study for the development of adaptive reading assessment.